The transportation team at the California Public Interest Research Group (a staunch supporter of Metro’s 30/10 plan) has issued an interesting report that attempts to debunk the oft-cited notion that highway’s are fully paid for by user fees, such as gas taxes and tolls. Contrary to conventional wisdom, their research illustrates that government has always used gas taxes for a variety of purposes, which have included public transit and general deficit reduction. The report contends that this misconception has been used to justify putting more money into highway construction and expansion, at the expense of investment in public transit. Above all, this report really points to the fact that the United States is profoundly under-investing in its infrastructure — as many other experts have said in recent years. The percentage of Gross Domestic Product spent on infrastructure in the U.S. is about two-thirds of what is was in the 1960s and about half of what Europe spends today — you know, that continent with the extensive high speed rail network and intra-urban transit. 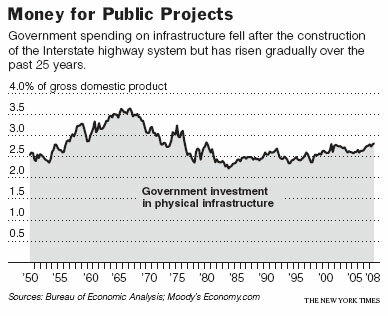 As this New York Times graph indicates, building the intestate highway system boosted investment in physical infrastructure, after which spending dropped off substantially. In a time of constrained federal budgets and crumbling bridges, how would you find the money to keep up investing in transit? Here’s the link to the PIRG report [PDF]. And here’s a link to Streetsblog’s coverage (disclosure: work there too!). Gas is too cheap. This is hard for people to swallow with prices at close to $3.50/gallon, but a couple of years ago they almost hit $5/gallon, and a couple of years before that the gas stations were scrambling to deal with the logistical issues of prices rising above $1.999/gallon. Europe also features far higher gas prices than the US. This has two impacts: it raises revenue, and it encourages people to drive less (and therefore use other modes more). Ultimately, what high gas prices do is internalize the full costs of driving… in infrastructure, pollution, and quality of life. Rather than taking choices away, they *give* us choices we didn’t have. If you want to live rurally, you will continue to drive… but that changes that equation, too. The US government puts a LOT of money into bringing health care, education, and other essential services to rural populations. It may be time to consider reducing the subsidy for rural living, or at least, subsidizing instead those who wish to move toward urban centers. Totally agree with Monica. Seems like an easy/simple fix. Besides people crying about it. The issue is not with rural drivers, as living in a rural setting inherently is dependent on a car by its very nature, and that’s fine. There is no way around that. The real issue with highways and driving is with the suburbs. We should certainly not further subsidize new highway construction (except for basic maintenance) for suburbs as that would be adding fuel to the fire when it comes to transit. Its about having new options. The problem is when suburbs have no good transit access to the city BECAUSE of the car and highway funding that replaces it, which has clearly shown its inefficiency. It should be about providing options and better alternatives, not to force people to use alternatives that are not efficient or well developed, which is all too often a problem with American cities. It should not be about penalizing people, it should be about developing sustainable and efficient urban transit to draw people to those modes which is often done incorrectly. So, its really more of an issue of where funds are directed rather than the total amount of funding.